As a company, we have a wide experience in all types of work from high school's to bus shelters. 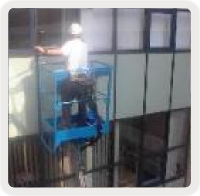 Methods used to clean the windows are based on Health and Safety requirements and the results required by the customer. We work for numerous contract cleaning companies who require window cleaning services of high quality but at a realistic price. Through many years of experience, we understand that many want to be able to leave the day-to-day management to us so that they can concentrate on what is important to them, their business. As a company, we have a proven track record for fitting all the individual requirements of each job, whether that be small sites scattered over a wide area, or large ones taking many man days to cover. We are only to happy to provide a free, no obligation quote to meet your specific requirements - just get in touch!